Don’t let your marketing efforts go to waste. Find the contact information of physicians who would most care about your medical product or service with this email list of nephrologists today. Look up the contact information of those with the nephrology specialty now. Are you looking to sell dialysis equipment, kidney medication, or other relevant pharmaceuticals or medical products to the specialists who would be interested in them? This accurate lead list from Bookyourdata.com is full of physicians with the specialty of nephrology and contains all of the information you need to start networking and marketing right away. 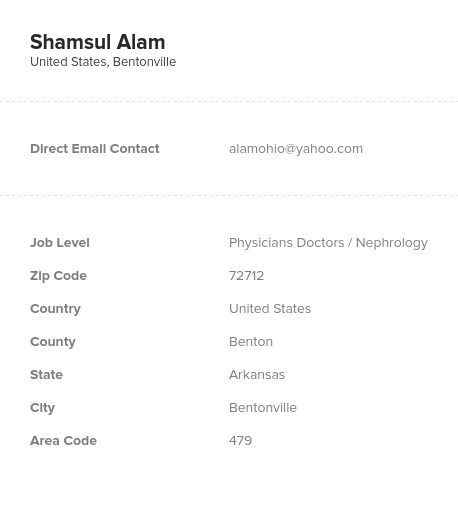 Using this one prospect list, you can connect with nephrologists at multiple hospitals, clinics, and medical organizations at once. By consolidating this list into one resource, we offer the perfect tool for kidney-relevant pharmaceutical and medical marketing! Nephrologists are doctors who focus on the functions of the kidney. They deal with complex medical equipment such as dialysis machines or urinalysis equipment and treat those who may have gone through renal replacement. Nephrologists, who are sometimes called renal physicians, also work with those who have diseases like hypertension, diabetes, autoimmune disorders, and certain cancers. The kidneys have an important function: They filter waste from the blood. If you have a medical product that can help doctors better understand this function or one that can help their patients with common diseases, let these physicians know now. This is one of our pre-built directories and is ready for you to download right away!